Forward your iPlum calls to three distinct numbers simultaneously. Mix external domestic, international or iPlum numbers. Receive notifications in the iPlum app when any call is forwarded to an external number. Use iPlum voicemail with call forwarding. When the call is unanswered by external number, it is routed back to your iPlum voicemail. Select display Caller-ID: Choose to show Origination Number (default settings) or iPlum Number as the display Caller-ID on the call receiving devices. Where to use Call Forwarding? You have a partner or an assistant who acts as your backup to receive customer calls when you are not available. You can setup three numbers to receive calls and the first one to answer gets connected. You advertise iPlum number for your business and you want incoming iPlum calls to route to your phone system or PBX. You care for privacy of your personal mobile number and use iPlum to call to your clients but you want all incoming calls to automatically forward to a mobile or landline number. You are an international user and want to receive incoming iPlum calls on your international number. You live in an area where the data connection is not good enough to receive calls in the iPlum app. You want all the incoming calls get automatically transferred to your mobile or landline number. Online portal: Login https://my.iplum.com/. Click “Call Forwarding” in the left panel and select the iPlum account which you want to forward from. Enter the external number(s) you want to forward the calls to. You can add up to 3 numbers to forward your iPlum calls. Can I add my iPlum number in Call Forwarding along with external numbers? 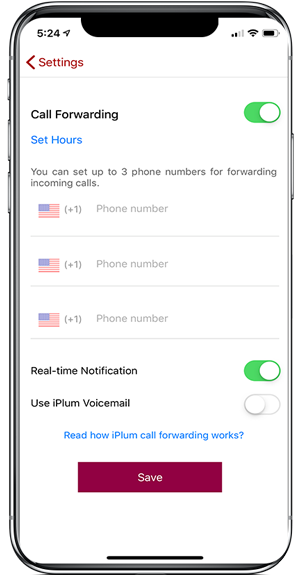 Yes, if you want to ring incoming calls in your iPlum app as well as external number/s, you would enter your iPlum number as one of the call forwarded numbers. How does Call Forwarding actually works? Does the call first coming into my iPlum app? After enabling call-forwarding, the system does intelligent call routing directly from iPlum cloud network. You don’t need to keep the iPlum app open on your device for call-forwarding to work. For outgoing calls or to send/receive texts you would still use iPlum app. 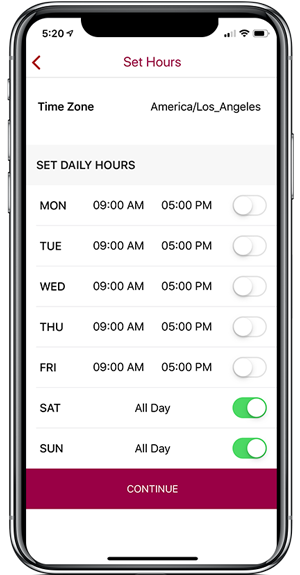 Once you enable call forwarding, you can change it anytime using iPlum app or online portal. Cost: There is no separate plan for Call Forwarding. iPlum unlimited usage plans for U.S., Canada or Toll-Free includes the Call Forwarding for their respective countries. If you are on an iPlum measured usage credits plan, you will use credits for regular incoming iPlum calls plus the call-forwarded destination number charges as per the low call rates in iPlum Settings. What Caller-ID will show for iPlum Calls? You can choose to show Call Origination Number (default settings) or iPlum Number as the Display Caller-ID on the call receiving devices. Setup an iPlum business team account. Change from iPlum regular number to a Toll-free number. Setup Call-Forwarding from external number to use iPlum while you are travelling internationally.